Too much to do? Not enough time? 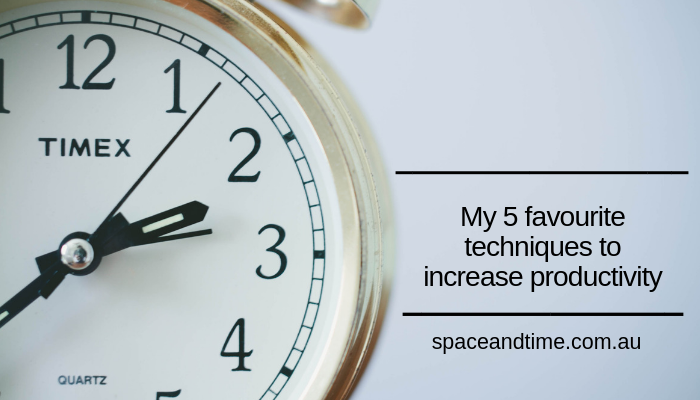 Try one of these 5 techniques to help you work smarter and get more done in less time. The basic premise of this technique is to set a timer and get stuck into the task. Initially when this technique was written. the developer suggested a 25 minute time span. Set the timer for a shorter or longer amount of time depending on the project. Remove all other distractions and get stuck in. 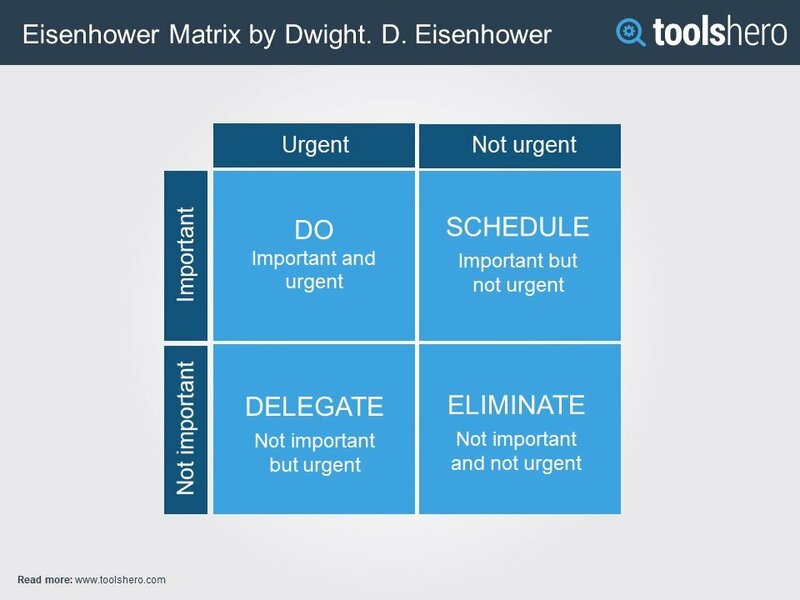 Eisenhower’s Urgent/Important Principle prioritises which activities are important and which are, essentially, distractions. Plot the items from your to do list into the matrix to decide which item to work on first to avoid wasting time and to increase productivity. Brian Tracy, Entrepreneur, Professional Speaker, Best Selling Author & Success Expert talks about doing the worst job on your To Do list at the start of the day when you’re fresh and energised. On his website, Brian says “Mark Twain once said that if the first thing you do each morning is to eat a live frog, you can go through the day with the satisfaction of knowing that that is probably the worst thing that is going to happen to you all day long. Your “frog” is your biggest, most important task, the one you are most likely to procrastinate on if you don’t do something about it”. Use a page in the diary and break it down into 30 minute increments and allocate tasks to each 30 minute increments. This works really well if you have a bundle of stuff you need to get done in a day. This is the technique I use myself with great success. Productivity Consultant, David Allen, author of Getting Things Done urges his readers to use a Next Action list. This list includes the next 2 – 3 actions that you need to-do to move your project forward. Write the list on anything and anywhere (diary, notebook, other formal to-do app). Break the traditional to-do list down into next action clarifies what to do next. Instead of “write blog on moving house” the next action is “brainstorm ideas for moving house blog”. Launch straight into the next action to increase productivity instead of procrastinating. If you’ve got a busy schedule and too much to do and not enough time implement one of these strategies to get the most out of your day. Which one works for you? 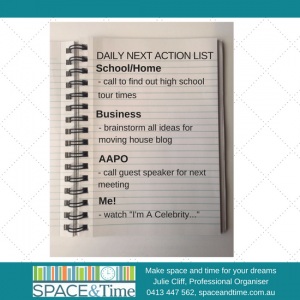 If you need assistance to prioritise all that you need to get done each week, I’d love to work with you. We can examine your goals and how you can get it all done in an easy step by step process. With my support, you can create the success and outcomes you deserve – go on, organise the life you want to live! My clients find that organising coaching helps them get everything done, and give them more time for spontaneity, enjoyment and relaxation. ← Need help with your life admin?